The 115th Fighter Wing recently celebrated its 70th anniversary. In the center of the logo (see picture) to commemorate the occasion is artwork from the unit’s original patch developed in 1988 for the 128th Tactical Fighter Wing. It features a drawn bow, symbolizing the constant readiness of the Fighter Wing. A lightning bolt, as the shaft of the arrow, representing the quick response of the unit, and a broadhead on the tip of the arrow, indicating the aggressiveness in which the 115th Fighter Wing carries out its mission. The logo is placed in an outline of the state of Wisconsin. The outline of the state is flanked on the left by the skyline of the capital city, representing the Wing’s commitment to the domestic state mission and the security of its skies. The 176th Fighter Squadron was organized at Truax Field in 1948. The F-51 Mustang was the aircraft assigned to the unit. In 1950, 10 of the unit's 25 Mustangs were shipped to Korea in support of the Korean War effort. In February 1951, the 176th Fighter Squadron was called to active duty but remained at Truax Field. During the active duty tour, the 176th Fighter Squadron converted its aircraft to the F-89A Scorpion. 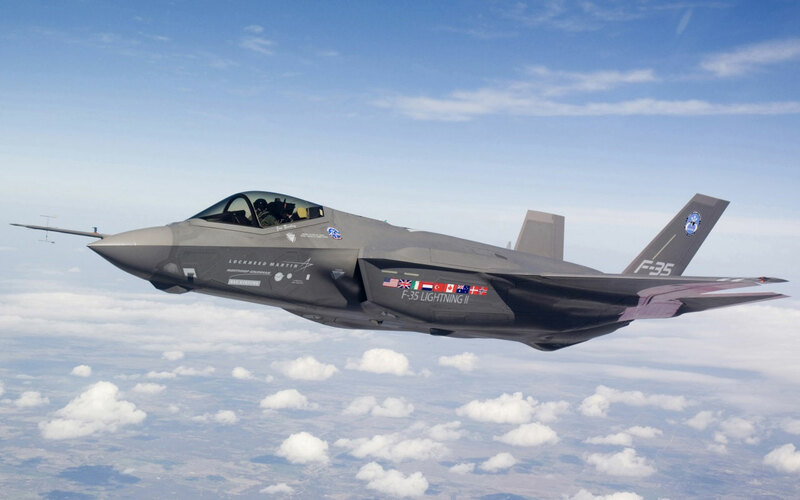 They became the first Air National Guard unit to fly the modern jet fighter. 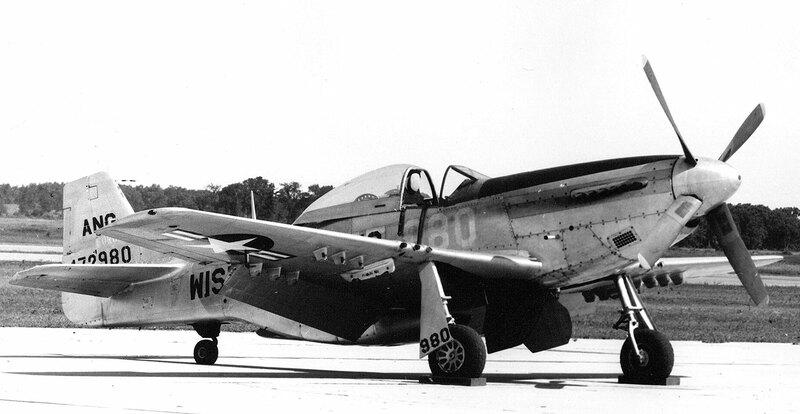 In October of 1952, the 176th returned to reserve status and state control, and converted back to the F-51 Mustang. One year later, 1953, the unit was redesignated the 176th Fighter Interceptor Squadron and converted to the F-86A Sabre. This was the legendary fighter that gained fame as a "MIG Killer" during the Korean War. In October 1955, the 176th Fighter Interceptor Squadron converted back to the F-89 Scorpion. During the next 12 years the 176th was equipped with each model of the F-89: the D model with 104 2.75 inch rockets, the H model with rockets and missiles, and the J model with the Genie rocket. During that 12 years, the role of the 176th went from that of stand-by reserve force to that of a force of being, a fully participating member of the air defense of the North American continent. The unit began transitioning from the Scorpion to the F-102 Delta Dagger in 1965. For the next nine years, pilots and crews were on a five minute (24 hours/day) alert commitment. 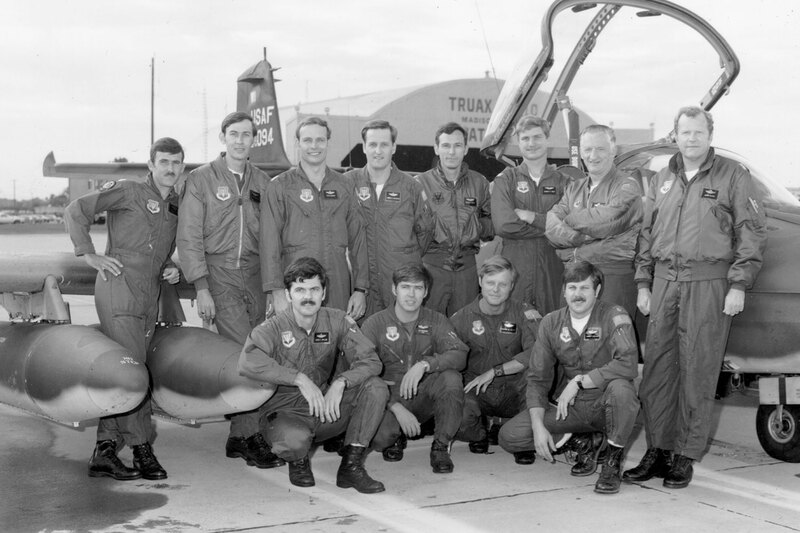 In 1972, the 176th was recognized as the best F-102 unit in the U.S. Air Force. During the year the unit won the William Tell Air-to-Air Weapons meet plus six other major awards. In 1974, the 176th underwent a major change in aircraft, mission, and designation. The role of the unit transitioned from fighter squadron to support squadron when the unit was redesignated the 176 Tactical Air Support Squadron (TASS). The aircraft was converted to the O-2 Skymaster observation aircraft with the Forward Air Control mission. After five years, 1979, the unit was one of the first to become Jet Forward Air Control with the OA-37 Dragonfly. This role wouldn't last very long. The wing would phase out the Dragonfly two years later. In 1981, the 176th Tactical Air Support Squadron transitioned again into a fighter role when the unit was redesignated as the 128 Tactical Fighter Wing. This time the Wing's aircraft was converted into the A-10 Thunderbolt II. During the next 11 years, the Wing performed the close air support mission, not only in support of Army units located throughout the United States, but on a global scale as well. Numerous deployments to Europe and Central America clearly demonstrated the Wing's readiness for worldwide tasking. In 1991, the unit received the first "OUTSTANDING" rating ever given to any fighter unit for an Unit Effectiveness Inspection. That achievement was a first for any active or reserve unit in the history of the Tactical Air Command. In addition, during this time, the unit received two Outstanding Unit Awards and numerous flight safety awards. In 1992, the unit was redesignated the 128th Fighter Wing, under the newly formed Air Combat Command, and it began converting to the F-16 Fighting Falcons. The roles of the new mission include aerospace control and force application. Typical missions include counter air, strategic attack, interdiction, and close air support. In October 1995, the 128th Fighter Wing was redesignated the 115th Fighter Wing with no change in mission or aircraft. The unit continued in readiness and preparing for all assigned tasking. In 1997 and 1998, the unit received its first combat missions, deploying to Incirlik Air Base, Turkey, for Operation Northern Watch and to Al-Jabber Air Base, Kuwait, for Operation Southern Watch; both operations enforcing no-fly zones over Iraq.